Bringing 30+ years of experience in project management (MBA, PMP) and aerospace systems engineering (BSA&A) to the South Bay community. Currently offering creative expertise in editing, web design, and small business consulting. Offering a wide range of capabilities within the South Bay as well as across the nation: Career expertise spanning multiple industries and non-profit organizations; a broad skill set of developed talents; and decades of diverse life experiences. 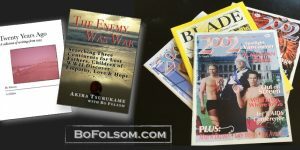 By the end of 2016, four published books will carry the ‘Bo Folsom’ byline. Seven consecutive editorials in a Southern California newsmagazine capture an astonishing slice of reality as the author addresses current events and powerful personal trials in real time as they unfold during 1993. Twenty years later, these first-hand accounts provide meaningful context and historical reference for the broad societal changes of 2013. Repackaged and reprinted as a stand-alone iBook, Twenty Years Ago is now available as a free download. Currently available as a free download from iTunes. A non-fiction historical manuscript that tells the tale of seven World War II seamen, most of whom perished aboard their submarines, and the journey of their offspring to rediscover their lost fathers. In the process, they ultimately find reconciliation and empathy spanning three continents. 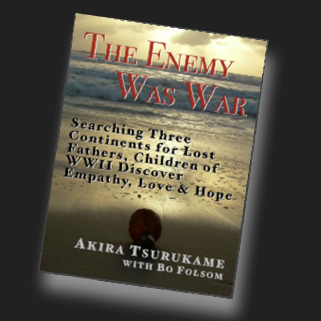 The Enemy Was War, a collaboration between author Akira Tsurukame and editor Bo Folsom, is currently in final edits en route to publication in advance of the upcoming 75th anniversary of the Pearl Harbor attack. Slated for publication by Dec. 1, 2016. A comedic memoir drawn from five-years of stand-up sets as performed throughout Southern California, including appearances at Universal CityWalk's Jon Lovitz Comedy Club, Flappers in Burbank, and the World-Famous Comedy Store on the Sunset Strip. The 30-some chapters of material derive from the author's personal sense of humor and unique perspective as a rocket scientist coming to terms with being gay. It also delves into pop culture, politics, and relationships, with universal themes accessible to all. Slated for publication this Fall. A collection of short stories intended for self-publication by the end of the year. Four non-fiction pieces are complete (including "Twenty Years Ago"), with two fictional works in progress. The collection addresses historic civil rights issues, commentary on pop culture, and tragic shortcomings of science fact. Slated for publication in 2016. Invest in yourself and take your work to the next level! With cost-effective solutions, sliding-scale rate structures, and guaranteed results, Bo Folsom can improve your product and reputation. Whether supporting the local South Bay writing community, coaching individuals to improve personal skills through improv and stand-up comedy, or providing activities in natural outdoor settings to help dogs and their guardians become more social and well-balanced, Bo Folsom is having a positive impact in the South Bay. Keep up to date with breaking news, announcements, and more. Leverage Bo Folsom’s expertise to empower your own work! Call, click, or email to start the process.